Felix was great! He was efficient and personable. He'll be the first one we call if we have any future plumbing needs! Felix Rivera was my tech today, he was very nice and went way beyond the call duty. I would definitely use him again. Great worker. I gave PP five stars on all questions and Felix was great. He arrived on-time and worked hard to get the job done. However, I cannot recommend PP for one reason; cost. We paid $1800 for what amounted to about six hours of work. Can't stress our appreciation to Felix but the cost, in my opinion, cannot be justified. I'm a property manager and have used a lot of plumbers, and these guys really are fantastic compared to some of the other companies I've used. They're honest and friendly and very willing to help however and whenever! The process was quick and easy. Transparent with cost structure and options. All issues explained clearly and no high pressure sales. 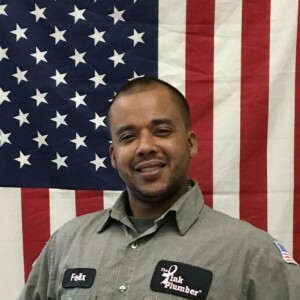 From Pink Plummer - Mr. Felix Rivera did an outstanding job starting from the presentation to finishing the job. Come to work on time, clean up after himself once finish and follow up with all the instructions. Overall extremely please with his service, very kind, polite, good listener and very professional. Felix from the pink plumber did a great job fixing our leak. Thanks! Felix was very courteous and knowledgeable. Replaced my water heater in no time at all. Too expensive. 603.00 to fix a leak at supply line. Rip off in my opinion but hurricane Irma was on its way so had no choice. Would NEVER recommend. Problem fixed and Fernando was very professional. Prompt & polite. Resolved issue quickly. On time, spent a few days finding a leak and repairing a pipe underneath the concrete slab. Extremely helpful, reasonably priced. Both plumbers, Tom(TJ) and Felix did very well on the job. I have used them in the past and will again in the future. Felix was informative and willing to share his knowledge. He looked out for my best interest when making recommendations. Felix was very conscientious about his work and it was very appreciated. He is a great asset to The Pink Plumber because I will be recommending the company, especially him, to neighbors and friends. I had an emergency situation on Labor Day. My shower caused a leak and flooded my laundry room and kitchen pantry. I called Pink Plumber and was given an estimate of 1 hour. Felix R. was at my door in LESS time and he was nothing short of amazing. He was able to find the leak and fix it within a couple of hours. He was so neat and cleaned up the job so well, that other than some sopping wet towels, you would never have known there was a leak at all. I was extremely pleased with the service and will request Felix R. for all my plumbing needs from now on. He's a true professional. Felix was out here in an hour he was knowledgeable and fast. Will use the service again. He acted like a use car sales man, was only concerned about how much money he was making.